Through a blend of self-insurance and reinsurance, ICRMA delivers $30M of limits per occurrence to its Liability Program members to protect them from third-party losses associated with tort liability, automobile liability, public officials’ errors and omissions, and employment practices liability. Click here to view the 2018-19 Liability Memorandum of Coverage. Because each public agency has a unique risk appetite, members can determine how much risk they are willing to accept by selecting a self-insured retention from $250k to $2M. 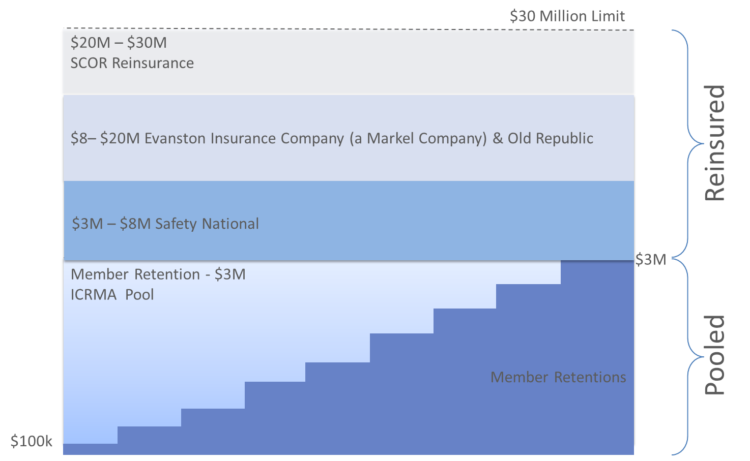 The chart below shows how the various layers of loss are funded from the member’s retentions up through the reinsurance that ICRMA purchases. Members have the choice of contracting with one of two third-party administrators (TPAs), Carl Warren & Company or AdminSure, to oversee their day-to-day claims management. ICRMA hires a Liability Program Manager to oversee claims likely to exceed the member’s retention and to ensure members receive the best results possible. ICRMA commissions biennial claims audits on behalf of program members to ensure TPA claims handling is meeting ICRMA’s approved standards. The most recent liability program actuarial study can be viewed here. Under the MOC, coverage is provided for drones that are owned by member Cities and operated in accordance with FAA guidelines (see the FAA website for more information). If your city acquires a drone, it must be reported, along with the basic underwriting information, in order to be eligible for coverage. Please complete this questionnaire and send a copy to the brokerage team at Arthur J. Gallagher. ICRMA member claims should be entered in the third-party claim administrator’s system within two working days of receipt of the loss. Within 30 days of the City’s receipt of notice of a claim, the Member is required to report the claim to ICRMA in accordance with the applicable Memorandum of Coverage (MOC). Some members have contractually transferred this responsibility to their selected TPA, but this remains the Member’s responsibility per the MOC. ICRMA’s litigation manager will be responsible for reporting to ICRMA’s excess insurer(s) or re-insurer(s). View the MOC for liability claim reporting requirements. Public Crisis Event Coverage provides payment for expenses incurred during an event that generates adverse multi-state or national news, or that has components of escalating intensity that interfere with normal operations of the City. ICRMA’s reinsurer will pay, on behalf of the Member City, reasonable and necessary expenses incurred during a crisis event. This program offers coverage from the first dollar and is not subject to a deductible or self-insured retention. Crisis Events must be reported as soon as possible to trigger coverage. Members receive assistance from a crisis communication firm to respond to the media, and to maintain or restore public confidence in the Member agency. Please see the Crisis Response Protocol page for a complete description of the coverage, as well as reporting information. The ICRMA Governing Board adopted Performance Standards for liability TPAs to ensure appropriate claims handling. Click Here to download a PDF version of the Standards. The ICRMA Governing Board adopted Litigation Management Policies and Procedures to ensure appropriate claims handling. Click here to download a PDF version of the LMPP effective July 1, 2018. This report template was created to ensure adjusters provide consistent and complete updates to ICRMA. The timeline summary is meant to serve as a helpful summary. Please refer to the Performance Standards for complete details.